Sorry for being MIA the last few days, but I have an excuse: Luke and I adopted a puppy from Woods Humane Society! We had our hearts set on adopting a boy, so we could name it "Frank," but when we saw this sweet little girl we changed our minds and named her "Frankie." Frankie is a Jack Russell Chihuahua mix. She weighs a little under ten pounds, is a little over seven months old, loves to cuddle, and likes going on walks. She is a little skittish towards men, but it's only been a day and I think she will come around. When we adopted our cat Lebron from the shelter he was scared of everything and everyone, but now he is the most loving cat. Hopefully, this will happen with Frankie too. On Sunday I spent the day sewing this dog bed for Frankie. 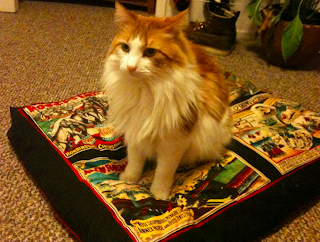 Lebron immediately sat down on it to test it out, so I took a photo :) The fabric is a quilting cotton with an awesome retro circus look to it. The whole project looks easy, but it still took a while! Well, the piping and stuffing were the most time consuming part, but I will go into details in a later post. Frankie LOVES her toys, especially her Gumby one, I had to get her that. You probably don't know, but Gumby was my first boyfriend. 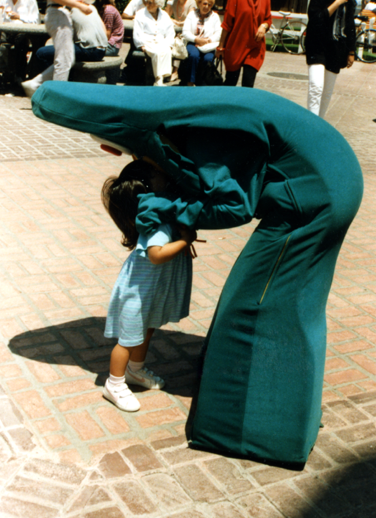 Me and Gumby circa 1986(?) in Santa Monica, California. So, dog owners: do you have any tips for me? I have never had an indoor dog before and I know house training can be a lot of work... Luckily, Frankie has been such a good dog so far (knock on wood), but I can use all the advice I can get! Oh my gosh, what a cutie! And of course you know I love Lebron. Piping scares me, so I'm looking forward to see how you handled it! Nice! I'll have to give piping a try. Mary, that's so cool that you are a fellow JRT lover! I had one growing up, but it was not nearly as nice and sweet as little Frankie :) If you have any tips on raising JRTs please let me know! I can use all the info I can get. What a sweet pup! Tips for house training are consistency, consistency, consistency. When my dogs were little I tried to take them out every few hours, and I always rewarded them with a treat and lots of praise when they went outside. It didn't take long for them to figure out peeing in the grass = yummy treats. 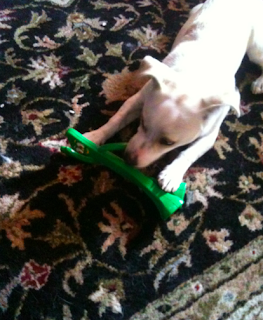 :) Also, we took a clicker training class from our local humane society. It's training based on positive reinforcement, and we really loved it. And the new bed is cute too! Lucky Dog! I have heard good things about clicker training classes. I need to look into it. Thanks for mentioning that! Congratulations! What adorable pets you have. I can't offer any advice, I haven't independently owned an animal. I think I will echo a few above me, and say that consistency is the key. It's hard work, but it's worth it! :) Fortunately, when we got our Ruby Tuesday, she was only 6 wks old but already potty trained. We lucked out. Wow, already potty trained?!?! Lucky! :) Do you have any pictures of Ruby Tuesday? I want to see her! ADORABLE! Congrats on the addition to your family! Congratulations! I must de-lurk over cute puppy/kitty pictures! We have an 8 year old pit we got when he was 2. Like the others ladies above said, consistency is crucial. But the other 2 things that are so important are exercise and making sure your pup knows who's boss. I know it's cheesy, but the "dog whisperer" advice really works: exercise (1st), discipline (2nd), love (3rd). 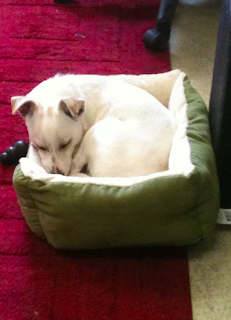 Also, the dog bed is adorable! Great job tackling piping!! But that was a few years ago before I had a dog. Aw, congrats. She looks adorable. I hope house training and keeping going well for you! So far there has only been one "incident." Hopefully the last! It's been interesting with the cats so far... Frankie isn't aggressive with them, which is good, but she is very jealous when I pet them. She is half way potty trained. When she goes outside she knows what to do, but she doesn't really let us know, we just have been letting her out every few hours. She's here at the shop, come by! EEEEEE!!! You got a puppy!!! I have lots an lots of tips on house-training boy dogs (very different from female dogs) so feel free to text me anytime! Congratulations to your little family, Frankie is a lucky dog! Congratulations on the new dog. She is adorable and I'm in love with her white fur! I once had a dalmation and the best advice I can give is crate train. It taught her (her name was Kate) to have a space or her own. It was like her room, her own little haven. I respected her space and she respected mine. Good luck! ARGH She's white like Doris Day! We are twinnies! Happy families with your new pet! I haven't read all the comments, but I do want to add that I'm pretty anti-C. Milan. I prefer positive reinforcement, and it's worked really well with our skittish dog. Expose her to men, get men to toss treats on the floor/ground, but not interact, bend over, reach out to pet her. Let her come around to them by providing her with a safe environment, where she knows you've got her back. If she's afraid of hats, sunglasses, backpacks, where those things and act normally to desensitize her.